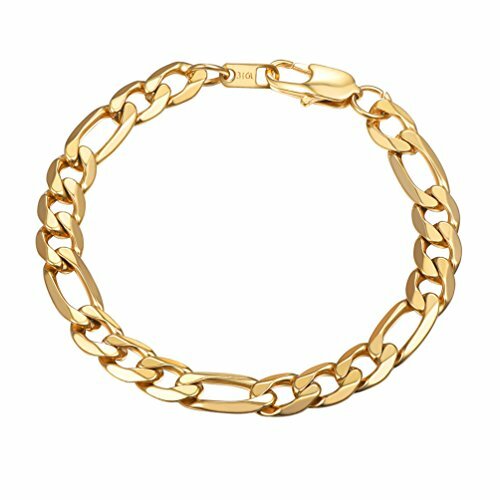 OUR 7MM GOLD FIGARO BRACELET IS AMAZINGLY BEAUTIFULWalk into a room with a crowd of people and heads will turn. You're wearing what looks like fine solid gold but we'll never tell! LIFETIME GUARANTEEDOur jewelry is made from REAL 24K Gold over semiprecious metals. We use extra layers of gold to help it resist tarnishing and to look authentic. Because it is an overlay, there is less than 1% chance it will ever get damaged or worn. Should a defect occur, simply send it in to us and we'll replace it for free. There is NO TIME LIMIT!VIP CLUBBecome a member of our VIP Club and receive big discounts, first look at new styles just out, and tips on fashion jewelry. Instructions are on the Insert Card that comes with your jewelry.QUALITY TAGWe've created each piece with a Lifetime Jewelry quality tag to show it's real gold layered over a core of semi-precious metals. Each tag is inscribed with "LJ 24KGL" to mark its authenticity.GIFT GIVINGYour jewelry will come in a nice black velvet pouch for easy gift giving. What a great present to give to a friend or loved one this holiday season! Lifetime Jewelry is for Life. Buy it once, own it for a lifetime. Elegant simplicity. This lovely bracelet for men showcases the lustrous beauty of gold filled to perfection. A masculine gold color jewelry that will blow anyone away.What is Gold Filled Jewelry?Gold filled jewelry is composed of a solid layer of Gold, which must constitute at least 5% of the item's total weight, mechanically bonded to a base metal. Gold filled jewelry pieces have the same appearance as 14 karat gold, yet more affordable. Gold filled items are 5 to 10 times thicker than regular gold plating and 15 to 25 times thicker than gold electroplate. The product is easy to care for and will usually maintain its golden shine for a lifetime. Our gold filled products meet the highest quality standards in the industry. 90 DAY MONEY BACK GUARANTEE-100% satisfaction guaranteed. That is our promise. So, if you're not completely happy with your purchase within the first 90 days, just let us know. We will do whatever it takes to make it rightThe fashion pendant can be used as a men's gift, you can send it to your friends to congratulate them when they have a birthday or have a good luck. ?It also could be a party jewelry when you have to attend a formal or informal event.The gold pendant necklace makes you look more charming.The pendant necklace is light weight,you will feel comfortable when you wear it.Our jewelry is a gold plated chain pendant necklace, when you wear it you will looks very noble, so it is popular among successful men .It's a perfect men gold pendant necklace! About Feedback: Your satisfaction and positive feedback is very important to us. Please leave positive feedback and 5 stars if you are satisfied with our items and services. If you have any problems with our items or services, please feel free to contact us first before you leave negative feedback. We will do our best to solve any problems and provide you with the best customer services. Made in USA,highest quality in the market. GOLD RETENTION TIME 2-3 YEARS....10times last longer than regular plating. 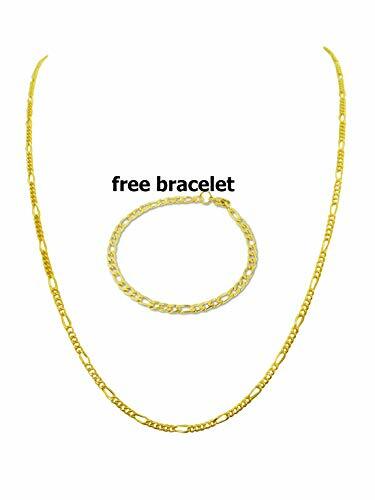 LIFETIME FREE REPLACEMENT WARRANTY.because .. made in USA ,unconditional life time warranty with free replacement,when the gold wears off overtime we will replace with brand new one as many times as you want ,HYPOALLERGENIC ,we use finish coating of 18k gold(US standard gold color for jewelry) on surgical steel,for scratch resistant.long life and hypoallergenic.Chains have been tested and they are NICKLE, LEAD and ALLERGY FREE so your skin is safe with our chains.,100% MONEY BACK GUARANTEED if you have allergy reaction,green mark, SWEAT PROOF AND TURNISH RESISTANT..you can wear at gym, pool party, beach party,any weather, any occasion,we use latest processing technology and special coating to provide long life and wear resistant,plus lifetime free replacement. 100% MONEY BACK GUARANTEED AND FREE SHIPPING.. 90 days money back guarantee FOR ANY REASON. stainless steel, also known as inox steel or inox from French "inoxydable", is a steel alloy with a minimum of 10.5% chromium content by mass. 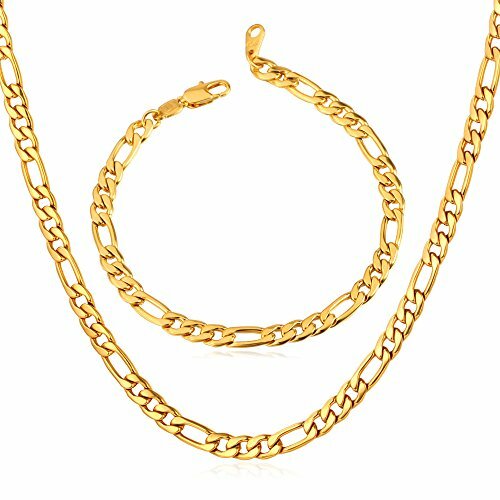 Figaro chain,Imported from Italy, 5 mm wide 5 Sizes Chain Necklace option: 18",22",26",28",30". Bracelet:8.3 inches Advantage of stainless steel Never fade endurable:Stainless Steel jewelry does not tarnish and oxidize, which can last longer than other jewelries. High polished and economic You can wear it everyday Brand Name: U7 "U7" means love you seven days for a week. U7 Jewelry is made with German imported polishing and electroplating equipment. Necklace length choice: 18-30 inches.PS:you can refrence to our model wearing different size chain in the picture show. Other chain necklace you may like: visit U7 Jewelry Storefront and search: stainless steel, you will find may other stainless steel jewelry, including necklace, bracelet and pendant. Necklace style:trendy,punk,rock,cool,hip hop,classic,suitable for party,gift,anniversary,wedding,everyday wear. Incription: 316L/18K Caring for your Jewelry Please try to keep it from water. Package content: 1 necklace,1 bracelet,paper card,U7 designgift box. 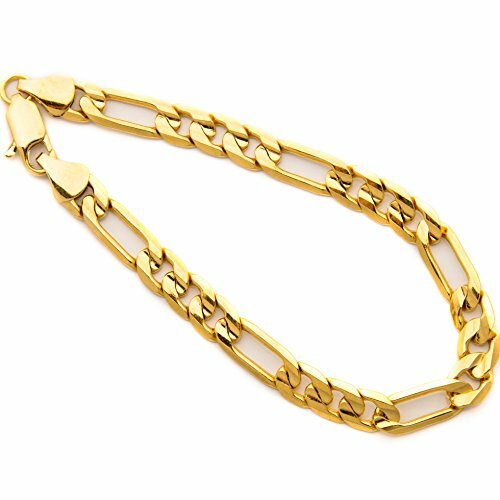 A lot of flash for little cash” makes this high quality gold filled Figaro chain necklace a must have. This 7.8 mm stunningly elegant necklace secures with a lobster clasp and comes in a complimentary gift box. Add this sleek and bold bracelet to your outfit. Crafted in lustrous yellow gold, its highly polished center plate is features a modern design with a link chain. This fantastic nine-inch ID bracelet is ready to be engraved and to serve you in years to come. The bracelet is secured with a lobster clasp and is enhanced with high-polish finish. A set of three round links separated by one long oval link creates a sensational repeating pattern on this traditional figaro design. 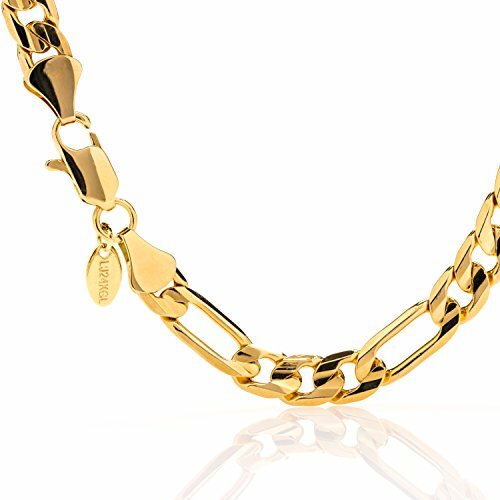 Measuring 7.3mm in width, this impressive 14k yellow gold semi-solid chain finished with a secure, lobster-claw clasp is hand-polished to give it a radiant finish. 8 inches in length. You can wear this classic Italian-inspired design bracelet on any occasion. 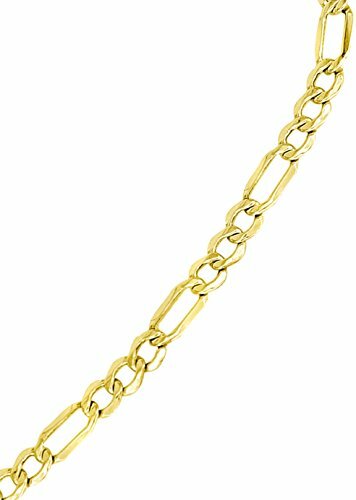 This bold and stylish nine-inch bracelet elegantly combines shorter and longer figaro links and is crafted in lustrous yellow gold. The timeless design of this bracelet makes it an incredibly versatile piece that can be worn every day, with any ensemble. This bracelet is enhanced with high-polish finish and is secured with a lobster clasp. 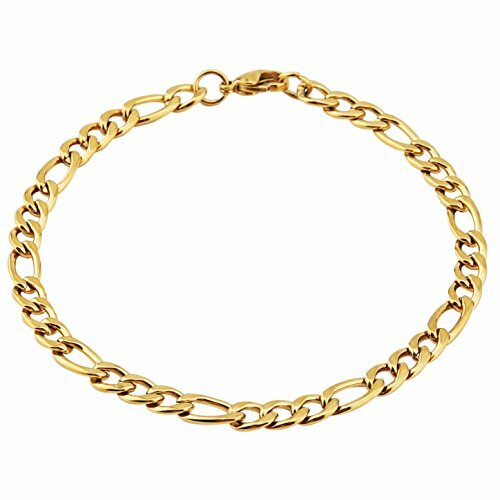 This 14k yellow gold classic figaro chain offers a modern bracelet look. 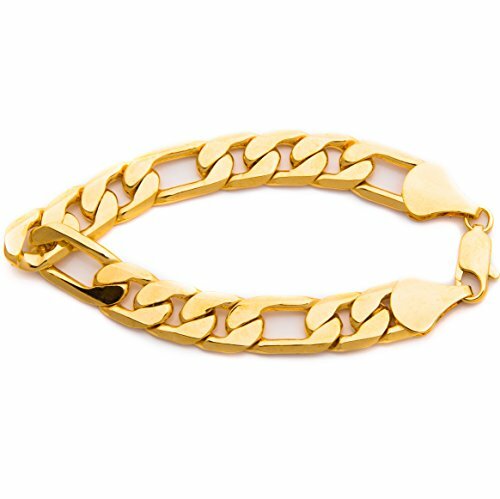 At a 5.0 mm thickness, this chain bracelet is available in an 7 and Length 8 Inch length. Includes a lobster clasp to uphold strength and comfort. 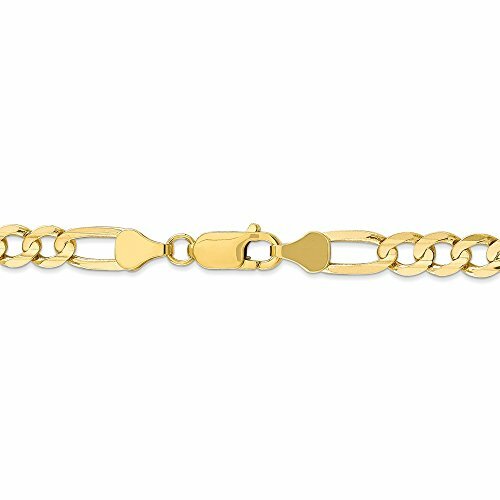 This men's mariner link bracelet showcases the classic beauty of high-polish finished yellow gold. A great addition to your wardrobe, this bracelet is perfect for any occasion. This bold and stylish nine-inch bracelet is secured with a lobster clasp. 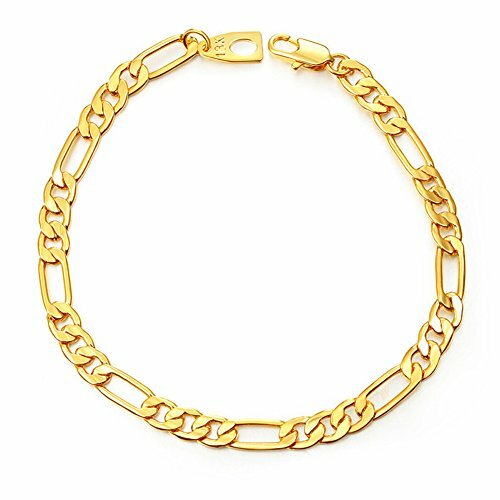 Elegant and fashionable at the same time, this high quality gold filled Figaro link chain is perfect for your everyday look. It can be used for a pendant or can be worn alone. This 3.2mm wide unisex chain secures with a lobster lock and comes in a complimentary gift box. If you are looking for the perfect bracelet that would go along really well with your attitude then this is the perfect stop for you. The biggest online jewelry store brings you the best collection of stunning bracelets that would add a lot more to your dynamic personality. JewelStop presents you a Figaro chain bracelet for men. By wearing this you would be a face in the crowd by leaving everyone else completely flabbergasted. 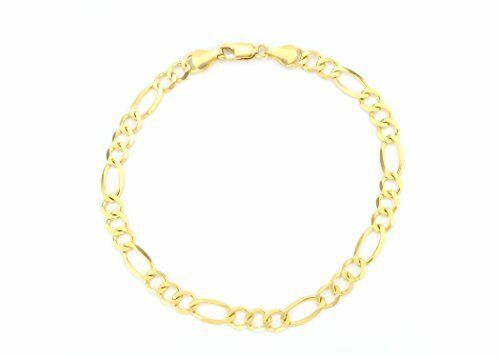 The chain bracelet has been crafted in 10k gold properly stamped and marked. 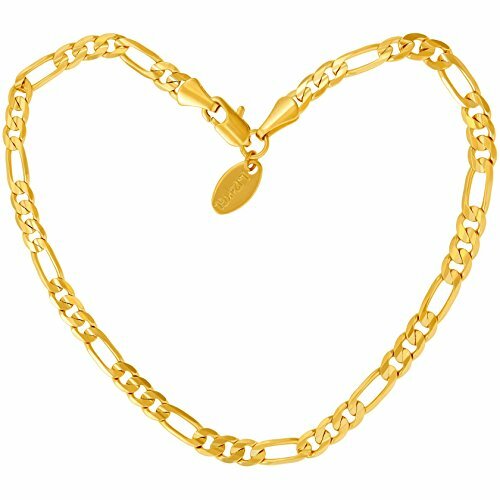 The golden yellow color further adds a lot more to the charm of this Figaro chain bracelet. 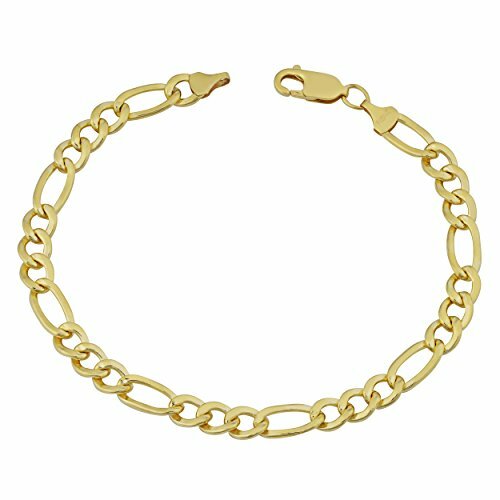 The gold chain bracelet has been elegantly designed and is 7" long and comes with lobster clasp. 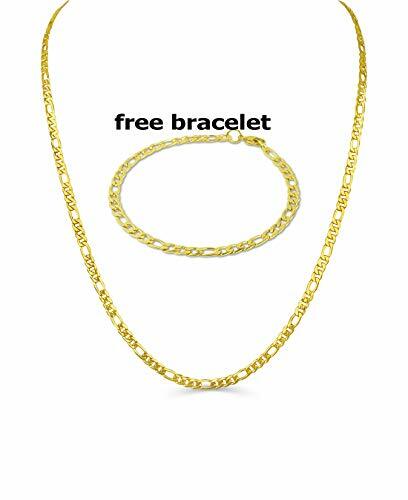 The men's chain bracelet comes with a guaranteed product quality and also 30 days money back. The package includes a jewelry box as well (domestic shipments only). So, what are you still waiting for? Grab this elegant bracelet at the earliest before it is too late! Please note that images have been enlarged to show better detail. 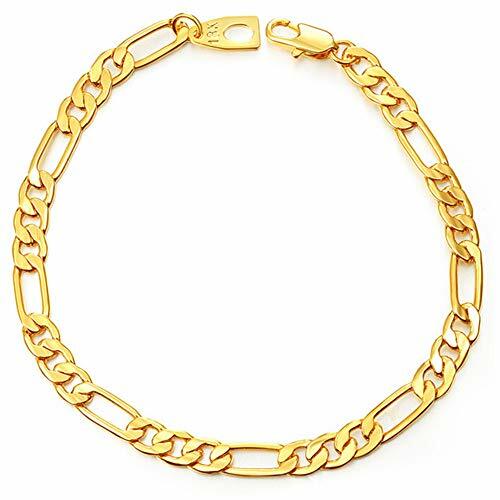 10K Yellow Gold Italian Figaro Chain Link Bracelet Mens Women 2mm-9mm, 7" 8"
Solid 10K Yellow Gold 2.5mm-12mm Figaro Link Chain Bracelet Mens Women 7" 8"
14K Yellow Gold 3.5mm-7mm Italian Figaro Chain Link Bracelet Mens Women 7" 8"
10K Yellow Gold 7.5mm Figaro Chain Bracelet Lobster Clasp Mens Women 8" 8.5"
10K Yellow Gold 4.5mm Figaro Chain Bracelet Lobster Clasp Mens Women 7" 8"
Looking for more Mens Gold Figaro Bracelet similar ideas? Try to explore these searches: Wet Dry Hoover, Pintle Hook Adapter, and 6 Traits Writing. BlesDeal.com is the smartest way for online shopping: compare prices of leading online stores for best Mens Gold Figaro Bracelet gift ideas, Mens Gold Figaro Bracelet deals, and popular accessories. Don't miss TOP deals updated daily.